KUCHING: Sarawak is working with Chinese multinational company Huawei to develop an e-wallet, or digital payment system, to be called ‘Sarawak Pay’ to enhance the state’s development of financial technology. 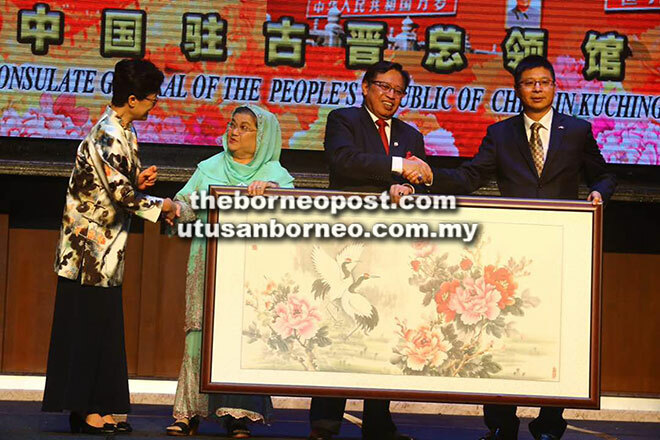 Chief Minister Datuk Patinggi Abang Johari Tun Openg revealed this at the 68th Anniversary of the Founding of the People’s Republic of China celebration dinner at a leading hotel here yesterday. “We are going to establish our own (digital payment) platform called Sarawak Pay, and this will enable us to have e-wallet or e-pay which can be linked to our neighbours like Indonesia, Thailand and of course China (Alipay),” he emphasised. “In today’s China, if you buy things with money, they immediately know ‘ini mesti orang luar’ (must be an outsider) because everybody there pays with their smartphone,” he pointed out. With the system and network, Abang Johari explained businesses or entrepreneurs can do away with opening letters of credit and instead only require sufficient funds in their account to make transactions in secured environment. In April this year, the government engaged Huawei to assist in transforming the state through digital economy, including in hardware and software development. Earlier on, Abang Johari praised China’s rapidly progressing development over the past 30 years since the country opened its doors to the world. From Shenzhen, a fishing village that has grown into an industrial hub, to the world’s fastest train technology, he said the adoption of technology and application of Chinese philosophy and tradition in its development should be emulated by Sarawak. “It has since opened up the entire China, including the interiors. Along this historical transformation, I admire the concept and philosophy of (late) Chinese leader Deng Xiaoping. “Keep a cool head and maintain a low profile…’jangan mau eksyen eksyen’ (don’t boast). Never take the lead but aim for something big,” he quoted the humble Deng. Abang Johari wife’s Datin Patinggi Dato Juma’ani Tuanku Bujang, Chinese Consul-General in Kuching Fu Jijun and wife Liu Sha, Minister of International Trade and E-Commerce Dato Sri Wong Soon Koh and Minister of Education, Science and Technological Research Minister Dato Sri Michael Manyin Jawong were among those present.